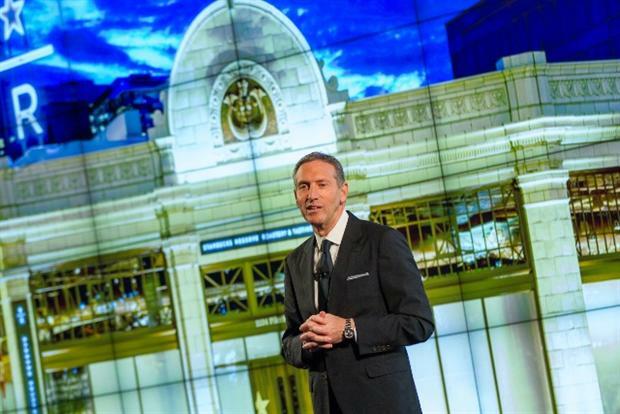 Starbucks CEO Howard Schultz outlines five-year growth plan. Starbucks has outlined a five-year plan to boost sales to $30 billion over the next five years, with mobile commerce and a new premium brand, Starbucks Reserve as key linchpins for its growth. During the company's investor day, CEO Howard Schultz unveiled the plans to make Starbucks a "great, enduring company." His chief strategy officer, Matt Ryan, outlined the seven planned strategies for growth, including adding third-party partnerships, an improved position in the coffee supply chain and addinig more stores in the United States and internationally. Mobile will be a key battleground for Starbucks, with the launch of its mobile order and pay service, which allows customers to order their coffee in advance for faster pickup in-store. The service is only available in Portland for now, with plans to roll the service out across the U.S. in 2015. It isn't clear when the service would be available internationally. Chief digital officer Adam Brotland also confirmed the company was exploring how to deliver coffee to individuals. He said: "Delivery is one of our most requested ideas. We are exploring several different options to make this a reality. Delivery will launch in select markets in late 2015." Starbucks sees 47 million transactions per week across its 12,000 physical stores, boasts 8 million active members of its My Starbucks Rewards loyalty program and 12 million users signed up to its mobile apps. Schultz also revealed that Starbucks plans to extend its Starbucks Reserve coffee brand, opening dedicated stores that only serve the premium beverage. Starbucks has opened its first dedicated Starbucks Reserve store in Seattle, a 15,000-square-foot space with upscale decor. The company tested a similar concept in London in 2011, but the first Starbucks Reserve areas were contained within existing Starbucks stores. Now the company plans to open 100 standalone premium stores that only sell Starbucks Reserve coffee. Schultz said: "We are building a new brand within Starbucks. We have an opportunity to make history. I’ve never been more optimistic, more enthused about the things that we are going to do." The article first appeared on marketingmagazine.co.uk.